In this summer issue of JointHealth™ insight, we report on new information presented at the European League Against Rheumatism (EULAR) Annual Congress, which took place in Madrid, Spain, in June 2017. Approximately 18,000 arthritis researchers, clinicians and patients met in 40°C temperatures to share, discuss and debate the latest in arthritis research. From the Congress, we share with you news of the launch of a EULAR campaign that calls on stakeholders to work together to improve both diagnosis and access to evidence-based treatments. ACE continues to monitor the important topic of biosimilar research and development to provide our members, subscribers, followers and the arthritis public the latest, unbiased information on this class of medications for inflammatory arthritis. In this edition, you will read the highlights of the ongoing results from the “NOR-SWITCH” and “DANBIO” studies. Complimenting those articles is a close look at the work of the Danish Rheumatism Association. They presented results of a national patient education program on biosimilars in Denmark and ACE had an in depth conversation with the lead author. 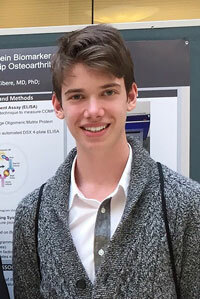 But we begin this special issue on current osteoarthritis research with an exciting profile of a budding young scientist who shares his personal journey to discovery in the disease and news about the launch of an Osteoarthritis Tool for family physicians in Canada. There are currently more than 4.4 million Canadians living with osteoarthritis (OA). Within a generation (in 30 years), more than 10 million (or one in four) Canadians are expected to have OA. There will be a new diagnosis of OA every 60 seconds, resulting in almost 30% of the employed labour force (one in three workers) having difficulty working due to OA. In addition, approximately 500,000 Canadians will be suffering with moderate to severe disability due to OA. Typically, OA patients, searching for solutions to their pain, seek help from primary care practitioners and other healthcare practitioners such as physiotherapists, occupational therapists, nurses, chiropractors, and pharmacists; however, these care providers often do not know how to effectively diagnose or treat this chronic condition. To address this gap in effective OA diagnosis and the management of patients living with OA, The Arthritis Alliance of Canada (AAC) and The College of Family Physicians of Canada (CFPC) have developed and launched the Osteoarthritis Tool to assist family physicians with a standardized guideline in their daily clinical practice when dealing with patients who present with symptoms of osteoarthritis. The Osteoarthritis Tool provides healthcare providers with key professional knowledge and skills necessary to effectively identify, assess, monitor and care for people with OA. It has also been created to help OA patients take an active role in their self-management – by providing access to the right information and resources, at the right time, with the right providers. Osteoarthritis (OA) is the most common form of arthritis affecting 31.5 million people in North America and costing $68 billion annually. But OA is not only an issue due to its numbers, it is also a serious issue because there is currently no known way to predict who will develop OA and no medication that can treat or cure it. For these reasons, I embarked on a research project that would help progress the knowledge of early diagnosis of OA during my senior year in high school. While I had the drive to do so, science is not a sea you can sail alone no matter how much you long to reach the shore. With incredible help and guidance from Dr. Jolanda Cibere from Arthritis Research Canada, Dr. Anthony Marotta from Augurex, and Ms. Cheryl Koehn, from Arthritis Consumer Experts, I transitioned from a high school student who wanted to help, to a scientist who has found his first piece of new knowledge for the world. In April 2017, I entered and presented my findings and placed third in British Columbia in the Sanofi Biogenius Competition with my study “Association of Cartilage Oligomeric Matrix Protein Biomarker Levels in Femoroacetabular Impingement (FAI) and Hip Osteoarthritis”. 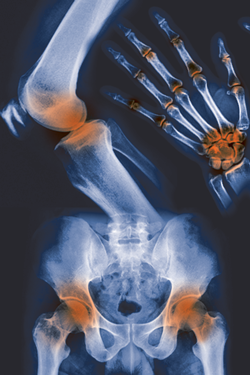 The study was an important first step into the field of osteoarthritic biomarkers. Here is the amazing irony science holds: The result isn’t always the most important part — asking the right question is where the discovery process starts. My study consisted of testing serum (filtered blood), provided by Dr. Cibere, for traces of a biomarker. A biomarker is used by measuring a substance in the body that helps to predict or diagnose a certain clinical outcome. For example, when someone has high insulin (the biomarker) levels then they may have diabetes relationship between a substance and outcome that I focused on were the levels of the cartilage oligomeric matrix protein (COMP) biomarker, and its levels in the serum of people with the clinical outcome of FAI. FAI is a hip joint disease very similar to hip OA but is milder than hip OA meaning that people with FAI may develop hip OA later in life. The COMP biomarker has already been tested with hip OA, therefore what I did was measure the level of a substance in people with a condition very similar to hip OA and hoped it might lead to any insight into the early diagnosis of hip OA. It didn’t. My hypothesis that the COMP biomarker and FAI hip condition could provide some knowledge into the early diagnosis of hip OA was wrong. The results showed that COMP just wasn’t the right fit for the relationship I was trying to find. The late nights I spent in the lab, the tedious deskwork, the months of poring over science articles, the in-depth access to a biotechnology company, and the time I spent with my mentors, it was all invaluable knowledge that wasn’t wasted with a negative result. The experience, knowledge, drive, and guidance led me to be able to pursue a question that hadn’t been asked before, and the answer – regardless of a “yes” or a “no” – is new knowledge and provides important information for future research. The study helped to narrow down some important correlations between the FAI hip condition, hip OA, and the COMP biomarker that the field would not know about unless I had been wrong. To put things into perspective, the only study like mine had around 20 male athletes as research subjects. With the help from my mentors, my study was able to test 142 men and women of all different ages. Notwithstanding the negative results of my study, I still presented at the Sanofi Biogenius Competition, which is a national competition for biotechnology science projects. After multiple presentations, saying the same things I have written here but with larger words and math mixed in, the judges came to the same conclusion as I did: the answer isn’t as important as the process or the question. With that, my presentation placed higher than all of the positive results in the competition and I also was given a nice $1,000 as prize money which comes out to a whopping $3.20/hour wage over the months I worked on the study) and $100 was donated to my high school, Sentinel Secondary, to encourage other students to pursue science. The knowledge I received from my experience this year has made me ready and prepared for the world of advanced research and science. Because of my mentors, I was recognized for the passion I have for science, and this passion for learning has, in turn, led me to accepting a place at the University of British Columbia where I will be studying science and business in the UBC Bachelor and Master of Management Dual Degree program. I am happy to say that my career of science has just officially begun. 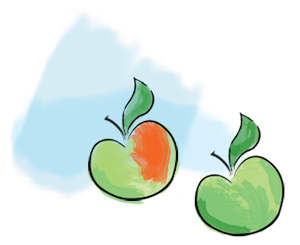 Since its introduction in 2000, the EULAR’s Annual Congress has become the primary platform for exchange of scientific and clinical arthritis information in Europe. It is also a renowned forum for interaction between medical doctors, scientists, people with arthritis/rheumatism, health professionals and representatives of the pharmaceutical industry worldwide. 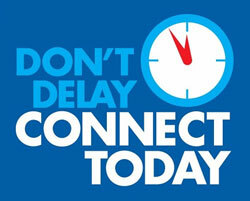 On the first day of this year’s Congress in June, EULAR launched the “Don’t’ Delay, Connect Today” campaign. People living with arthritis often go undiagnosed for years, missing a critical window for early intervention. In response, the new EULAR campaign will help rheumatologists, general practitioners, policymakers, and patients change that. The EULAR campaign neatly parallels the models of care work ACE is supporting as part of the Arthritis Alliance of Canada (AAC). Canada faces similar challenges to the way healthcare is delivered to people living with inflammatory arthritis (IA). To address these challenges, in particular the goals of timely access and targeted care, ACE and other members of the AAC are working with Canadian stakeholders to create a patient-centred, team-based approach to the management of IA that includes processes to remove barriers and promote early referral and treat-to-target disease management approaches (see “A Pan-Canadian Approach to Inflammatory Arthritis Models of Care”). Immunogenicity is the ability to stimulate an immune response in the body of a human or animal. This ability generally protects people against pathogens by recognizing and reacting to foreign proteins. It is a specific concern for biologic medications because they are primarily protein medicines that may be seen as being foreign. An immune response to a biologic medication can range from development of detectable but not clinically significant antibodies to an immune response with significant impact on patient safety. A patient’s immune response may also affect a treatment’s effectiveness. Additional immunogenicity data from the first randomized trial of transitioning from an originator biologic to its biosimilar was presented at EULAR 2017 by Norwegian researchers who led the NOR-SWITCH study. The researchers found there was similar frequency of adverse events in patients transitioned from the infliximab originator (Remicade®) to the infliximab biosimilar Remsima® (approved as Inflectra® in Canada). Based on the researchers’ findings, patients doing well on infliximab (Remicade®) who were transitioned to infliximab biosimilar Remsima® reported similar frequencies of adverse events, including infusion reactions, and experienced no substantial change in anti-drug antibody (ADAb) levels compared with those remaining on infliximab originator (Remicade®). These results from the ongoing NOR-SWITCH study show there are no concerns about transitioning patients with rheumatoid arthritis from infliximab (Remicade®) to its biosimilar Remsima® (Inflectra® in Canada). Also at the EULAR 2017 Congress, studies showed that two biosimilar tumor necrosis factor inhibitor (TNFi) medications are no more immunogenic than their originator biologic in patients with rheumatoid arthritis. Results of one of those studies, which involved 544 RA patients, showed 33.1% treated with SB5, a biosimilar candidate for adalimumab (Humira®), and 32% of those who were treated with adalimumab (Humira®) developed antidrug antibodies (ADAbs) after 24 weeks’ treatment. “These findings further support the biosimilarity of SB5 to adalimumab (Humira®),” said study investigator Jonathan Kay, MD, director of clinical research, rheumatology at the University of Massachusetts Memorial Medical Center in Worcester and professor of medicine at the University of Massachusetts. 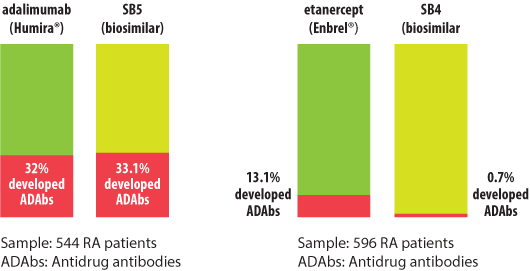 In the other study, which involved 596 RA patients, significantly fewer treated with SB4, a biosimilar candidate for etanercept (Enbrel®) developed ADAbs versus etanercept (Enbrel®) (0.7% vs. 13.1%, P less than .001). Jirí Vencovský, MD, who presented the findings of the study with the biosimilar etanercept, made similar observations as Dr. Kay, regarding the effect of ADAbs on efficacy. “Efficacy tended to be lower in patients with ADAbs,” said Dr. Vencovský, who is vice-director of the Institute of Rheumatology, Charles University in Prague, Czech Republic. Using the American College of Rheumatology (ACR) Criteria, which are a standard criteria set to measure the effectiveness of arthritis medications in clinical trials, Dr. Vencovský saw no differences between the patients who received biosimilar etanercept or originator biologic etanercept (Enbrel®) for both the ACR50 and ACR70 responses after 24 weeks of treatment. When the first biosimilar was approved in Denmark in 2015, the country’s national council for the use of expensive hospital medicines announced that they found the biosimilar infliximab (Remsima®) equal to the originator biologic (Remicade®) in efficacy and safety. Based on this, the council made a recommendation for hospitals to use the less expensive (64% lower) infliximab biosimilar for both treatment-naïve patients and patients already on infliximab (Remicade®), unless there were medically justified reasons not to do so. By the first quarter of 2016, this biosimilar covered around 97% of infliximab consumption in Denmark. There are now two biosimilars of originator biologic infliximab approved by the national authorities in Denmark, and used in the treatment of patients with arthritis. 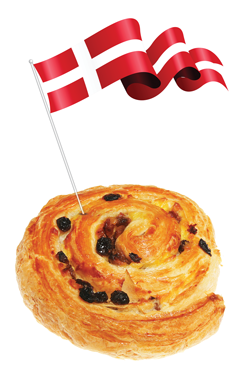 Denmark became the first country in Europe to introduce a policy transition (i.e. a transition also known as “non-medical switching” that necessitates patients to change their medicine of choice to another, typically less expensive, medicine, not for a medical reason) for rheumatoid arthritis patients doing well or “stable” on originator biologic infliximab (Remicade®) that mandates them to be transitioned to the biosimilar infliximab (Remsima®). There was concern that an increase in the use of healthcare resources, because of patient and physician anxiety about the new class of agents, would offset the cost savings, but a study presented at EULAR 2017 showed that that offset did not happen. In their study, Dr. Glintborg and her colleagues assessed total healthcare services used and the number of days with healthcare services used in the 6 months before and the 6 months after the policy transition. During the 12-month study period, 1484 outpatient visits were made by 769 patients with rheumatologic inflammatory diseases. In total, 19,752 individual services were provided, and about 10% of those were on the transition date. And of the 9243 days on which at least one service was provided, 693 — or approximately 7% — occurred on the transition date. There was a slight increase in the mean number of days with services from before the transition to after (5.4 vs 5.7; P = .0003). Differences between the two time periods were not significant for services related to nursing activity, methotrexate treatment, blood pressure measurement, conventional synthetic disease-modifying antirheumatic drugs (DMARDs), venous needle, conversation about treatment, ultrasound over extremity joint, or ultrasound under extremity joint. “The clinical significance of the findings is that the services used before and after switching to a biosimilar from a bio-originator were not different,” said Désirée van der Heijde, MD, from the Leiden University Medical Center in the Netherlands. These data, and the experience of thousands of patients on biosimilars in Europe over the past 10 years should assure inflammatory arthritis (IA) patients in Canada that policy transitions are in fact safe, effective and cost effective. ACE believes these savings should mean more inflammatory arthritis patients will be provided reimbursement access to biosimilars and new therapies for IA will be added to public and private formularies in a timely manner. That is equity in treatment. One of the benefits for ACE in attending world leading scientific meetings such as the EULAR is the opportunity to meet representatives from other arthritis patient organizations and share experiences, perspectives and best practices. At this year’s EULAR Congress, for example, ACE held meetings with the Danish Rheumatism Association (DRA), a non-governmental organization with an 80,000-person membership. The DRA were at the meeting to present its patient biosimilar education experience based on participation in a national program for patients that guide the way for future best practices for the Canadian arthritis community. Even when clinicians shared data pointing to the clinical equivalence of a new biosimilar, many patients remained unhappy, she explained. They understood the economic reasons for the switch, but didn’t like the element of surprise, their lack of involvement in the decision, or the relatively short amount of time they were given to process the change. The Danish government required everyone to switch within a 2-month period, so there was limited time for patients to get their questions answered. To address the fear and insecurity over being transitioned from a biologic to a biosimilar treatment for their arthritis, the program was designed to ensure patients received independent information about biosimilars, along with closer monitoring of prescriptions to provide reassurance about their safety. “In order to change this situation, we started a dialogue with politicians and the authorities on a national level and hospital administrations on a regional level,” said Ms. Lene Mandrup Thomsen from the Danish Rheumatism Association. “The purpose was threefold: to improve the registration of biologics and biosimilars on a batch-level, the provision of more independent patient information and the involvement of patients in the decision-making process,” she explained. In addition to this national plan, hospitals on a regional level have invited a representative from the DRA to participate in a working group, with the objective of including the patient perspective in future national recommendations concerning originator biologics, biosimilars and transitioning. The Canadian healthcare system differs significantly from the government-sponsored, single payer, Danish system, in which patients could be made to transition unless a medically justified reason prevented treatment with a biosimilar. In Canada, patients living with inflammatory arthritis may have more say in their own treatment options and the right to ask for and expect the best care possible through shared decision-making between themselves, their rheumatologist and other healthcare providers. ACE believes patients should be fully informed about policy decisions transitioning them to a biosimilar. They should be able to assess treatment (or no treatment) risk against benefit, and have tools to enable them to discuss the pros and cons of all treatments with their healthcare team. We also encourage both public and private payers, who are considering policy transitioning, to consider the DRA’s example in advocating for and making more accessible greater education and safety monitoring as a means of alleviating any concerns Canadian patients may have about biosimilars.